When Karolina Hartwell is pulled over in her own neighborhood and arrested for drunk driving on New Year’s Eve—even though she has had less than a half a glass of wine—she thinks it is some sort of giant misunderstanding that her senator husband will be able to clear up in no time. She thinks so, that is, until she realizes, with the help of her longtime friend Miriam and acquaintance Emily (yes that Emily, from The Devil Wears Prada), that her senator husband just may have set her up. Emily, former assistant to the infamous Miranda Priestly, editor of Runway magazine, is living in L.A. with her hunky husband and has become the “fixer” to the stars—until Olivia Belle, the hot new publicist and stylist in town, starts stealing her clients left and right. With her husband working in Hong Kong and the latest in a long line of high-profile clients announcing her departure from Emily’s firm, Emily escapes to her idea of the seventh circle of hell: Greenwich. Emily despises the suburbs and what suburban life has done to her previously fabulous friend Miriam, who used to be a high-profile attorney and now spends her life in Lululemon chasing her three children. For Miriam, the upheaval that has ensued since her husband sold his company, she quit her job, and the family moved to the suburbs has Miriam fearing that her loyal and devoted partner may be cheating on her. When Karolina and Emily reconnect via Miriam, the obvious next steps become apparent. Emily the fixer will take Karolina on as a client to save her reputation and, altogether more important, help gain custody of her son. Adding to the high stakes game, Karolina’s son is not biologically hers and, though she begged to year after year, her husband never allows her to adopt him. Between over-the-top baby showers, Pilates class, and lots and lots of wine, the three women band together to form an unstoppable trifecta who can take on cheating husbands, overzealous housewives, and even overcome social suicide. But it is ultimately Miranda Priestly, who is trying to woo Emily back to Runway with amazing perks and a ridiculous salary, who helps in unexpected ways, showing this villainized star of The Devil Wears Prada in an entirely new light. While on the surface this a story of revenge and retribution, it is ultimately a tale of the power of female friendship and the bonds that can withstand absolutely anything—even the pure hell of becoming a social pariah in Greenwich. Each of these women is engaging and relatable. Readers will be fighting for them from the first page to the last and will relate to how they each grow and change in unexpected ways. 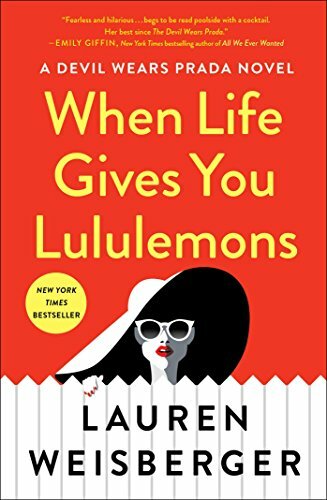 When Life Gives You Lululemons is the ideal read for this summer, with the right mix of suspense, humor, heart and Lauren Weisberger’s whip-smart prose. Fans of The Devil Wears Prada will enjoy the return to reader-favorite Emily’s signature sarcasm and sharp tongue while appreciating how her character has grown and developed. With plenty of laugh-out-loud moments, When Life Gives You Lululemons is a must for any beach bag!